How can you better secure your premises while slashing your costs? You've likely had to deal with guards who don't turn up... Or show up late... For those who did turn up, maybe they even showed up in jeans, didn't they? And you've probably gotten sleeping guards, no matter what the Grade - A, B or C - your security provider has. Or maybe they even told you, "My guards won't sleep!" But I'm sure by now, you know what really happens. Maybe they've also let up your barriers (while letting you down) for authorized and unauthorized visitors to come in, while they sleep with their legs propped up on the desk. Are these problems that you can do without? What if there's a small fire? Or a flood? Or an intruder or two? How is one guard going to manage fire-fighting, clearing waters, or even pursuing multiple intruders? The conventional solution has always been to add manpower. Which also doubles or triples your cost! And also probably causes you more headache if you paid for 7, but only 5 show up. Of course, you could always issue an LD (liquidated damages) against your security provider, but does that really solve your problem that's caused by.... Humans? Surely, there has to be a better way to prevent your headache? This is where our I-Guarding Solution and its advanced security technology comes in. Imagine replacing 2-3 night guards with our IFS solution, for up to 50% off your previous manpower costs. Each IFS has 3 I-Man inside, securing and monitoring your premises with the advanced face and motion detection technology we'll install in your building. Now, wouldn't it give you a better peace of mind knowing that you can finally have the best of both worlds, expert and responsive manpower + expert technology, securing your assets while you sleep well at night? With the new Progressive Wage Model (PWM) being kicked in in September 2016, and with the lacking numbers of manpower, we came out with our I-Man Facility Sprinter Solution. It not only resolves the manpower issue that the security industries are facing, but also provide a better security to the premises’ owners. 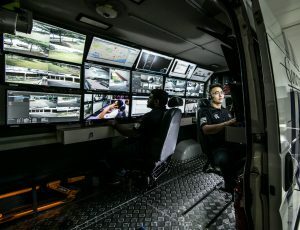 The I-Man Facility Sprinter (IFS) Solution presents a mobile command-and-control platform whereby our I-Men can work together as a team, and handle not just one, but multiple buildings connected together using our advance network integrated solution. Made possible with the use of TV White Space (TVWS) technology, I-Guarding utilities the IFS as a highly secure command and control mobile unit. It is manned by a team of I-Managers, who respond to emergency alarms immediately. Business owners will enjoy the benefits of receiving comprehensive services of 3 intelligent workers (I-Manager) with maximum cost savings and a higher level of service, bringing huge benefits to our country socially and economically. With the IFS Solution in place, you will be able to sleep peacefully at night, knowing that your building premises are in good hands. With scarce manpower and its increasingly high cost, the use of kiosks is becoming common in many service sectors. Dispensing of almost any items can be done with kiosks to reduce the headcount. The I-Man Access Control System (IMACS) is an advanced technological integration of the kiosk and access card control system. This new invention will improve security access control to the highest level without relying on physical human interaction. The host sends a secure pass-icon to the visitor (including contractor) to define a visit date and time through email or other media. The visitor accepts and prints the secure pass-icon. The level of security expectation will determine the need to define a visit date and time. For higher levels of security expectation, the visitor will need to provide additional details for accepting the secure pass-icon. The additional details will then be further verified at the entry position. At the premise, the visitor will scan the secure pass-icon at our I-Man Access Control System (IMACS) for visit and identity verification. With positive confirmation, the system will dispense our secure access card encoded/embedded with security features for use by visitor to gain access into and out of the premise. Our secure access card can be restrictive depending on the level of security expectation. We will determine entry / exit through kiosk / turnstile / gantry / door with anti-tailgating features with access control to car lift, floor, office and any other areas within the premise. At the end of the visit, the visitor is expected to leave the premise within a grace period. The visitor will need to use our secure access card to gain exit from the premise. Our system is able to retain our secure access card at the exit location. Our I-Man Access Control System (IMACS) is a game changer where it provides building security as well as visitor management services. 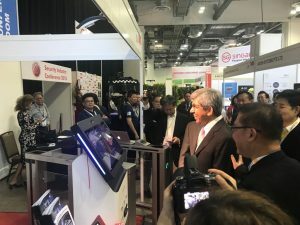 With scarcity in manpower and its increasingly high cost, the use of kiosks is becoming common in many service sectors. IMACS secures the building by auto-dispensing security passes to pre-registered visitors and as long as the visitors are in the building premises, their presences are tracked regularly whenever they tap into a secured room with their access passes. This new invention will improve security access control to the highest level without relying on physical human interaction.